Jim Peterik of The Ides of March just sent us this updated air date schedule for the WTTW broadcast of this historic concert ... as well as news about how you'll be able to get copies of the concert dvd and bonus cd's through donations to PBS once the program airs. Hope you are doing well, Kent! I wanted you to know that the Cornerstones of Rock: American Garage show - world television premier - airs on December 10th at 7:30 cst ... and then again right after at 9:30 pm. It will be rebroadcast on December 12th at 9 pm. 3-disk set DVD of the show with interview and behind the scenes footage. Also available will be a cd of the show with extra cuts ... and a bonus disk of the original masters of the songs performed plus other garage classics. Thanks for helping us get the word out. Rock on! Truthfully, Richard Marx's vocal effort on "Hazzard" really doesn't resonate with me. However, the video for the song is a magnificent, mind bending, visual effort. Questions for the house: Does the video remind anyone of Billy Joel's "River of Dreams" or, in the bigger picture, the film adaptation of Truman Capote's "In Cold Blood?" Whatever the case, the "Hazard" video proves that 35 years after the arrival of an entity known as MTV, strong producers with good story lines are still capable of entertaining us and challenging us intellectually with short film inspired by song. In simple terms, the Marx video was spell binding. Alas, we'll be moving to Phoenix from Colorado Springs (I'm retiring) on December 8, so there's no chance we can make the concert, alas. But I wonder if anyone other than me considers Marx's best song to be "At the Beginning," from the 1997 *Anastasia* soundtrack. It was the only good song from a so-so movie. Very clean, upbeat, feel-good thing with an extremely catchy tune --it got stuck in my head for days after we saw the film. Like you I'm a big fan of "Hazard," but it's kind of a downer, as much as I like Nebraska. Hazard is a real place, by the way, with a population of 68, about 30 miles north of Kearney. It lacks a river, however. In truth, I've liked a lot more of his songs than I've disliked, and I hope he comes back to recording in a big way. I've been a Richard Marx fan from Day One ... doesn't matter if he's doing his uptempo stuff (like "Don't Mean Nothing", his breakthrough hit from 1987, "Should've Known Better" or "Satisfied") ... or his beautiful love ballads (like "Right Here Waiting" or "Now And Forever"), his bluesy story songs (like "Hazard" and "Keep Coming Back") or a "touch of doo-wop" ("The Way She Loves Me") ... it's all good music to my ears. Marx took second billing to Donna Lews (hot off her #1 Hit "I Love You Always Forever") with the 1998 hit "At The Beginning" (#45) from "Anastasia". It's a goodie ... and definitely worth a spin here today. WOW ... front row seats for a legend like that ... amazing! Very cool! Awesome Kent ... quite an experience ... so close to a true genius and legend. It has to be weird to essentially have two versions of The Beach Boys out there, both playing (for the most part) the same music ... one featuring the guy who sang most of the hits, the other featuring the guy who wrote most of the hits. If you're going strictly for the music, who do you think is going to present it better to the audience? First of all, let me just say that it is IMPOSSIBLE to go see a Beach Boys show and not have a good time, no matter who's out front that night. And this is true for ANY age fan, whether you've seen them before or not ... this is just good old fashioned fun fun fun music ... and it's infectious and it carries you away. And honestly, in many ways, it's nice to have TWO sanctions of The Beach Boys touring ... but if pressed to choose, I'm going to go with Brian every time ... his back-up band is just phenomenal ... top-notch musicianship throughout. Mike Love tends to try too hard to convince everybody that he WAS The Beach Boys ... while Brian just calmly and serenely let the genius shine right on through. Granted, Love sang the bulk of the leads ... and cowrote many a hit with Brian ... but the genius of The Beach Boys is and has always been Brian Wilson. Mike's version of the band consists of him and Bruce Johnston, the guy who took over for Brian when he left the road to concentrate on the studio aspect of things. Nothing wrong with that ... I love BOTH of these guys and have probably seen them 20 times over the years ... but with Carl gone (he was always my favorite anyway), Dennis gone and Al Jardine on Love's "cannot fly" list, it's hard not to feel some amount of resentment toward the way he has treated the others. Once Love put the kabosh of the continuation of The Beach Boys' 50th Anniversary Tour ... and a second "comeback" album ... he fell off my list for good. Meanwhile, Brian has gone out of his way to keep the legacy alive by including other Beach Boys mainstays like Al Jardine, David Marks, Blondie Chaplin, and others as part of his means of keeping the music alive ... and we love it. (I've often joked that if Brian wanted to create a more realistic sound to match the records, he should simply hold his nose when he sings ... like he used to do in the old days when trying to capture the nasally aspect of Mike Love's lead singing voice.) The overall strength of Brian's voice is hit or miss these days ... and I think he'd be the first to admit it ... but I felt that by trading off lead vocals with Al Jardine, Darian Sahanaja and Scott Bennett the other night, he really delivered the goods in top-notch fashion. THANK YOU SO MUCH for the GREAT review and photos of the Brian Wilson Concert! What a THRILL it must have been to hear all those great songs he wrote in the sixties at the height of the Beach Boys career. Brian is a true genius NOT ONLY with his singing and writing but his ARRANGING of music that created the "Surf Sound". I have followed his career all these years and only wish I was there in person. Hope to see him next year if he tours. You said he didn't show much emotion, but he has been quoted as saying " I can't smile with my mouth but I do in my heart." He is a true SURVIVOR for all he has went through during his lifetime. Great to have him and Al Jardine together and share all these wonderful songs!! Keep rockin' guys -- you are the GREATEST AMERICAN BAND !!!! Wow, what a great review! Thank you, Kent!!!! I'm so glad you had fun! After hearing about the passing of Allen Toussaint, I had to get out his 1962 hit FORTUNE TELLER, recorded by Benny Spellman, and play it one more time. There was also version by a group called the Hardtimes in 1966, don't know if you remember that version or not. SAD news of the passing of Allen Toussaint. He has quite a musical legacy but I will ALWAYS remember him for writing "MOTHER-IN-LAW". In my top twenty of favorite songs, that is one of them. What a catchy tune. Thank You, Allen. If possible, Kent, can we have a bit of history of the making of that song? Like Allen Toussaint, Ernie K-Doe was another New Orleans artist and he recorded "Mother-In-Law" back in 1961. The song was written and produced by Allen Toussaint ... but the recording nearly didn't happen. Toussaint is considered an American Music Genius with a style uniquely his own ... he was, without question, one of the architects of what became known as "The New Orleans Sound". In 1998, The Rock And Roll Hall of Fame recognized his contribution and inducted him in the "Non-Performer" category. Here's Allen Toussaint singing the # 1Hit he wrote for Ernie K-Doe. If you listen close, Allen tells you the name of the guy with the bass voice that sings "Mother-In-Law." My sister-in-law filmed this off the screen in, I think, New Orleans. I worked with Allen on a few projects early in my career. Amazing man and what a talent. Saw him live two or three years ago here in Santa Fe, NM, where I live. He saw me in the second row and waved ... I was like a fan that night. Hit after hit of 'and then I wrote' ... we really have lost a big one!!!! Billboard has published their list of the 100 biggest hits of Hot 100 era for the third time in the last eight years. First put out in 2007, it was updated two years ago for the 55th anniversary of the Hot 100 chart. This time around, it is for their Greatest of All Time issue. The new version is based on the Billboard Hot 100 charts from August 4, 1958, the date the first chart was printed, through the chart of October 10, 2015. An inverse point system was used for each records position on each week's chart with the highest points being awarded to number 1 and the least to number 100, with adjustments made to points based on different eras and chart methodologies. 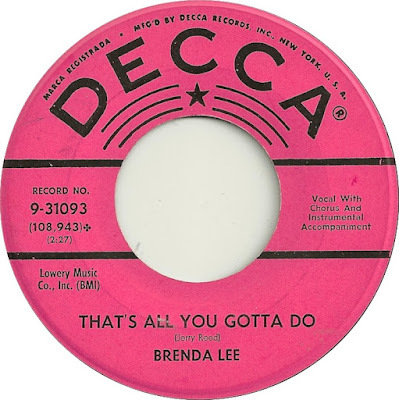 As this is only based on records that made the Billboard Hot 100 since its inception, there are a number of prominent big rock hits missing including Bill Haley and the Comets' Rock Around the Clock and a number of Elvis Presley's earliest and biggest hits, all of which charted prior to August 1958. The biggest new record to make the list that was popular in the last two years is Uptown Funk by Mark Ronson Featuring Bruno Mars which comes in at number 12. There are also five other new entries from Robin Thicke, Lorde, Meghan Trainor, Katy Perry and two featuring Pharrell Williams. The magazine also, for the first time, compiled the list of the top singles artists of the same 57 year period. The Beatles lead the list followed by Madonna, Elton John, Elvis Presley and Mariah Carey. Once again, Elvis most likely would have given the Beatles a run for their money had the period for the list extended back to the beginning of the rock era in 1955. And also hear an exclusive track featured (in of all places) The Wall Street Journal!!! So yes, we're happy to let ALL of our readers know that you can catch TWO incredible acts sharing the same stage (one most certainly Rock And Roll Hall Of Fame bound ... and the other certainly deserving of their own nomination) next April at The United Center here in Chicago ... and at several OTHER stops along the way as well. As tipped here a couple of weeks ago, Three Dog Night (aka Danny Hutton ... aka ONE Dog Night) has announced the hiring a new singer to allow the band to continue on the road. (Now we told you then that it would NOT be ... no how, no way ... Chuck Negron, one of the three (and perhaps the KEY) original leads ... Hutton maintains that this will never happen. So instead, he's brought on David Morgan to cover some of the bluesy, grittier lead vocals previously handled by the recently-departed Cory Wells. Or right here in Forgotten Hits! I take issue with "the god awful version of Unchained Melody." Many doo-wop lovers from NYC prefer that version. Jim Southern was telling you his recollections he had with Casey Kasem and his AT40. I was instantly reminded of the time that the radio station I was working for at the time (early 70's), had AT40 on late Sunday afternoons of which I was the board operator for it. Now if memory serves me right (and I could be wrong about this), but after the stations across the country aired the program, they were supposed to send the program back to the company which put the show out. I believe it was Watermark, Inc. At the time I was board oping AT40, I was privileged to obtain (on legitimate and honest methods), two shows that I really wanted to keep. They were the shows for 5/26/73, which mentioned the call letters of the station I was working for at the time, and the show dated 7/7/73, which was a special show of the 40 greatest disappearing acts of the rock era. Still have them. That said, there was a touring version of Steam around for something like 30 years including two brothers who were in the touring group the entire time, and they had originally been commissioned by the producers to go out and perform the hit ... while it doesn't make them legitimate, they made a living doing it for a long time. I've talked to Gary several times over the last few years ... we announced his book when it first became available several years ago. 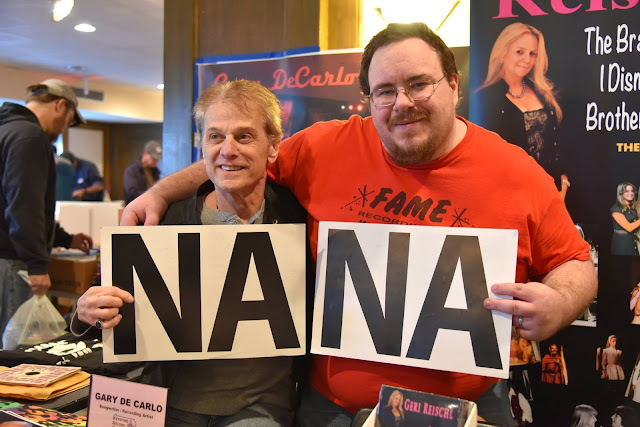 I was truly interested in reading Gary DeCarlo's story and I am glad I did. I was always curious to know the history of his music career and the Na Na song. However, this was the worst book I've ever read. With spelling errors and missing punctuation, sentences running together and the sequence of events way out of order, it was really hard to follow what decade it was in from page to page. The author started 90% of the sentences with 'Gary said', 'Gary was', 'Gary did' and so on. The reader knows this book is from Gary's point of view but it read as a 4th grader's book report with a hodgepodge of facts in no particular order. Unfortunately the owner / publisher became a crook by going into another business while still holding 100's of records that had been sent in for consignment sales. Mine were among the batches that he hadn't returned. I called numerous times until he stopped answering that line. I began writing letters in to Discoveries Mag and many others chimed in. I contacted the Orange Co D.A. and managed to get my records back to help many others get theirs. This was all circa '91-92. 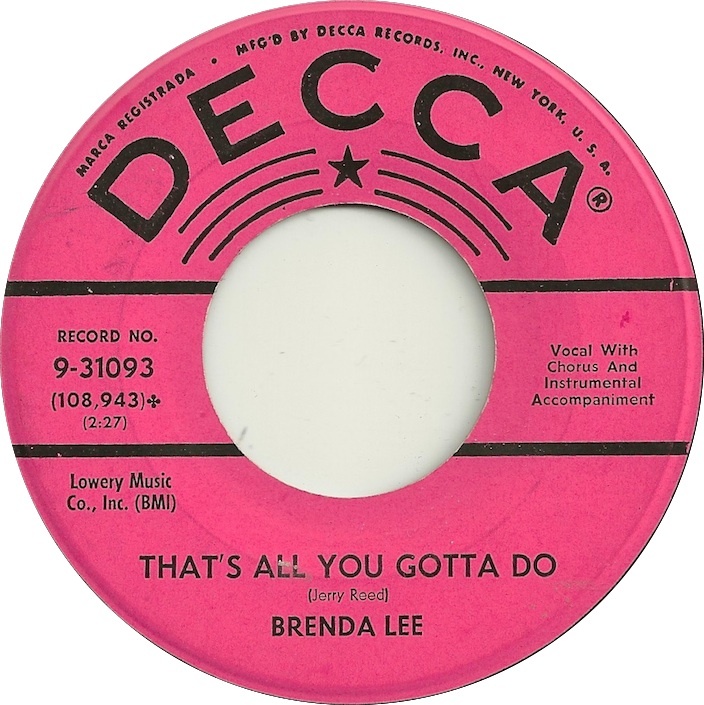 They recorded eight straight bombs for Capitol Records and needed a hit badly. Bruce and his friends cut summer school and went to the beach. One of the guys pointed and said 26 miles to Santa Catalina ... which gave Bruce an idea for a song. He took the song he wrote to Capitol. They didn't like it ... didn't think the rest of us would be interested in Santa Catalina. A week later he saw Nancy Sinatra at the movies. She said,"Bruce, when are you going to record the song you were singing at the beach? Me and& my friends can't stop singing it." 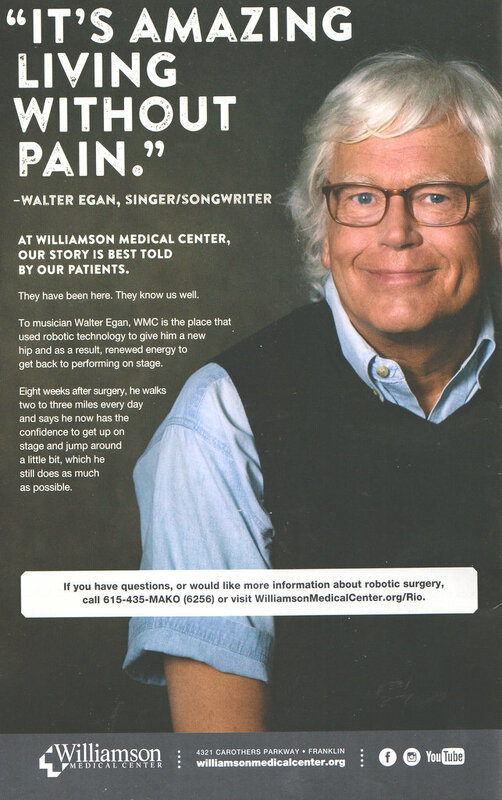 Here's an interesting ad I saw in the Nashville Symphony printed program.